Do you have an early reader at home? One of the best series for learning to read, or improving the skills of a new reader is the Pete the Cat books. not only are they easy-to-read for new readers but they are fun and contain themes that are understandable for early readers. This month we want to highlight the Halloween Pete the Cat. Pete the Cat: Trick or Treat is a fun book for early readers to read alone this holiday or to an older or younger sibling. Younger siblings will also love the fun flaps that surprise the reader with hidden illustrations. Readers can follow Pete as he experiences all the fun of Halloween. It even helps younger kids to understand the spooky elements of Halloween and see it as the fun and surprise that it is meant to be for small children. This fun early reader book is great for that younger child this Halloween. If you are a fan of Pete the Cat it is a great addition to a growing collection! 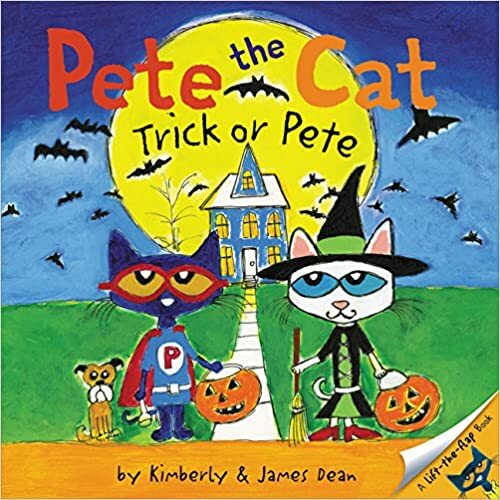 This entry was posted in reading and tagged best ooks, Books, boy boooks, early reader, fun books, halloween books, holiday books, learning, love to read, Pete the cat, Reading, reading books, the boys store on October 1, 2018 by Lacy. Every month we share a special book with our readers. Books are so important in childhood. They are important throughout our lives, but in childhood especially, books teach us invaluable lessons. They show us a world we could never imagine. Books open up our imagination, they give us language development, show us new friends, new places, and they teach us about ourselves. A child’s love and appreciation of books begins very early. Even the smallest of babies can appreciate and love a book. My youngest is almost two and he absolutely adores books. He brings them to me constantly begging for me to read them to him. He eagerly turns the pages, he touches the pictures, and he even “reads” them when I am not helping him. The best way to cultivate the love of books and reading is to introduce them to books very early, make sure they are age level appropriate, and developmentally appropriate. Appropriate sounds like such a strange word. Parents might be thinking content; the book doesn’t have content that would confuse or scare the child, but that isn’t quite what we mean. Did you know that the first 6 months of life children recognize images in black and white and bold patterns? So during this stage, you want to have books with bold patterns and stick to contrasting colors like black and white. After 6months+ you can add in books that have unique textures. Things the kids can feel and move, soft, hard, rough, scratchy, etc. Around one year you can add in ones that have sounds or pop-ups. These things can help with their development of space and depth. When you are reading with your young child try to read in a soft and soothing voice at first. As children grow change your vocal range with different characters. All of this adds to the experience of reading and teaches kids how to use language and their own voice. It also keeps them calm, or alert, depending on the inflection of your voice. Board books are always an excellent choice in early books. They are resilient. Therefore, board books can be used and abused by young hands. They also usually have very bright and interesting images and illustrations appropriate for this age group. 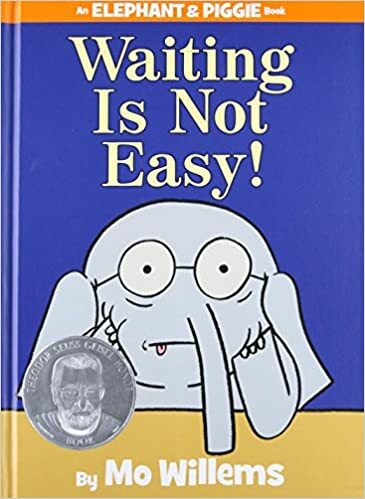 We recommend looking into lots of different types of board books, but you can never go wrong with Sandra Boynton. Her books have been a favorite of young readers and their parents for decades. Be sure to check out Opposites by Sandra Boynton. 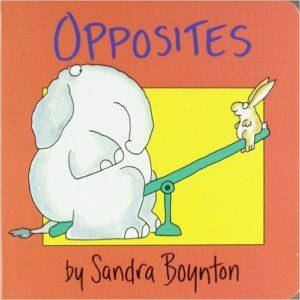 It is a fun story that will teach your kids all about opposites. This entry was posted in reading and tagged baby books, board books, Books, boys books, love to read, Reading, sandra boynton, the boys store on July 1, 2017 by Lacy.